Kliplite is a line developed by Wiese Manufacturing. At Wiese Manufacturing, we have been helping musicians, students, teaching professionals, and orchestras solve their music light and music stand lighting needs for more than 50 years. With the invention of the Kliplite; Wiese Manufacturing has revolutionized the music light industry by offering the best cordless LED clip-on music stand light on the market. Conveniently located in the Midwest, we are able to ship music lights anywhere in the United States and Canada. Most orders are filled within 24 hours. Meaning you will be able to enjoy your Kliplite music light sooner! We offer several light-weight, easy-to-use clip-on music stand lights for music professionals and students of all levels. Whether you are looking for a corded clip-on music stand light or our new Cordless LED Kliplite music stand light, Wiese Manufacturing can solve all your music light and music stand lighting needs. Don't go another day playing with your corded music stand light, try our Cordless LED Kliplite music stand light at your next performance. Our newest product, the Cordless LED Kliplite music stand light is the most convenient cordless music light you’ll ever use. It's portable, battery operated, state of the art design with eight powerful LED lights...there's no other LED clip-on music stand light like it! Wiese Manufacturing's Kliplite music stand lights will out-last and out shine every other music light. Remember if it's not a Kliplite with a "K" it's not the best LED music stand light on the market. You may purchase any of our music stand lights shown in this site utilizing our secure paypal shopping cart, or you can contact Wiese Manufacturing, at (563) 322-4567 or toll free (866)315-4567. Mail to P.O. Box 2001, Davenport, IA 52809-2001 or E-mail: Kliplite2@aol.com. The Cordless LED Kliplite music stand light is completely portable and light weight, this state-of-the-art battery operated music stand light allows up to 20 times longer battery life for up to 16 hours of continuous music light with standard alkaline batteries. 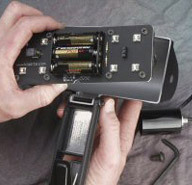 Replacement of the batteries in this music light is simple and quick. Eight long lasting LED's will provide music light in just the right place on your music stand or anywhere it is needed. Looking for music light convenience? You're looking for our Cordless LED Kliplite, there's no other music stand light like on the market like it! The Kliplite music light Cordless LED Insert Module allows you convert all of your older Kliplite model music stand lights into the new LED model music stand light with ease. When upgrading Kliplite music lights there is no need to purchase the whole LED music stand light to replace your current UKL/95/EU and UKL/II/EU model music stand light. Upon converting your Universal Kliplite you will be able to enjoy all of the features of our Cordless LED music light. If you are using a Universal Kliplite with a drop cord upgrade to cordless today! FULLY ADJUSTABLE MUSIC LIGHT. 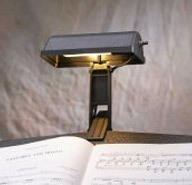 The Universal KlipLite UKL/II/EU music stand light can attach to all types of music stands and adjusts to any angle for music light on your music sheet. Made from injection molded nylon / glass, and finished in textured black. UL approved this music light comes with on-off toggle switch, full 8-foot cord, and can use standard 15 to 40 watt tubular high intensity bulbs. 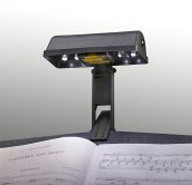 Also note that the UKL/II/EU music stand light may be upgraded to our Cordless LED Kliplite music stand light with our easy to install music light LED Insert Module.